While growing up, I heard my dad talk about “Lloyd Robinette, the Perry Mason of Blackwater”. Perhaps this was due to his help in preventing my grandfather from going to the Western front during WWI. Either way, I decided that I wanted to learn more about this man. Anyone familiar with Blackwater has heard of the Robinette family. There were among the earliest settlers in Blackwater. They have run the Robinette Funeral Home for many generations. Through the years, they have also run a general store and restaurant. The 2-story Robinette brick home stood for many years directly across from the funeral home. Secrist, M. (2013-02-01). Lee County, Virginia: History Revealed Through Biographical and Genealogical Sketches of Its Ancestors (Kindle Locations 1476-1486). . Kindle Edition. Robinette, Lloyd M., a lawyer in his native County of Lee and the common-wealth’s attorney, was one of the distinguished alumni of Roanoke College and the University of Virginia. He represents several of the old Colonial families of Virginia, and is eligible to membership in the Sons of the American Revolution. Mr. Robinette was born at Blackwater in Lee County, Virginia, March 26, 1880. The Robinette family is of French Huguenot ancestry. They left France during the era of Protestant persecution, first going to Bavaria, where the Huguenots fared little better, and then emigrated to Wales and then to Chester. When William Penn fitted out his expedition to America they accompanied him to Penn’s Woods, and from Pennsylvania came to Virginia. 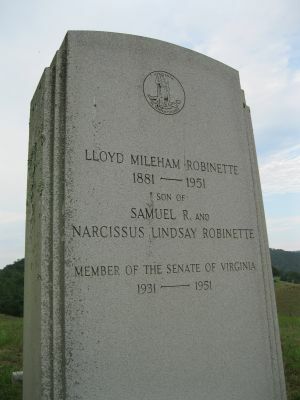 Among the fore-fathers of Lloyd M. Robinette were three successive Samuel Robinettes. Samuel III, born in Richmond, Virginia, in 1760, was the pioneer of the family in Lee County, Virginia, where he died in 1850. He married Anne Osborne, who was born in Grayson County, Virginia, in 1765, and died in Lee County in 1863. Their son, Isaac H. Robinette, was the grandfather of the Jonesville attorney. Isaac H. Robinette was born in Grayson County, Virginia, in 1802, and married Martha Stapleton, who was born in Lee County in 1804. Her father, a great-grandfather of Lloyd M. Robinette, was William Stapleton, a soldier of the Revolutionary War. Samuel R. Robinette, son of Isaac H. and Martha (Stapleton) Robinette, was born July 9, 1839, and was reared on a farm in Lee County. When the War Between the States broke out he espoused the cause of the South, entering Company B of the Twenty-fifth Virginia Cavalry. He was in service with this command until June, 1864, when he was captured at the battle of Piedmont. For nine months he suffered great privations and hardships as a prisoner at Camp Morton, Indiana. In June, 1870, in Hancock County, Tennessee, he married Narcissa Lindsay, who died October 13, 1893. She was born June 5, 1850, in Cass County, Illinois, daughter of Alexander Jennings and Elizabeth (Baldwin) Lindsay. Alexander J. Lindsay was born in Meadville, Pennsylvania, May 27, 1818, the son of Jesse and Catherine Lindsay, and died in Cass County, Illinois, in 1850. Elizabeth Baldwin, mother of Narcissa Lindsay, was born in Hawkins County, Tennessee, November 6, 1814, and was married December 25, 1842. She was a daughter of John and Elizabeth (Newberry) Baldwin, of Bedford County, Virginia. John Baldwin was a son of James Baldwin, born in Killarney, Ireland, and his wife, Elizabeth Ferrell, born in Dublin, Ireland. James Baldwin was another Revolutionary ancestor of the county attorney, fighting for American independence for seven years, and returned to his home on a short furlough only once during the entire period. Samuel R. Robinette and wife were the parents of eight children: Mary E., born April 6, 1872; Charles J., born June 1, 1875; Sarah C., born October 20, 1877; Lloyd M., born March 26, 1880; Lewis E., born October 25, 1882; Ida M., born May 5, 1885; Lillie B., born December 27, 1887; and Amos O., born April 9, 1891. Five of these children resided in Lee County. Lloyd M. Robinette grew up in a rural community, attended the local schools until the age of eighteen, and became a teacher as a stepping stone to a higher education and a professional career. He taught in the public schools of Lee County for a period of five years. For three years he was a student in the Jonesville Academy, and in 1904 he entered Roanoke College, where he was graduated with the second honors of his class and the Bachelor of Arts degree in June, 1906. After a year of travel he entered the law department of the University of Virginia in September, 1907, and received the Bachelor of Laws degree in June, 1909. Following his graduation he was elected an instructor in the law department of the university, and remained there until June, 1911, when he resigned to engage in private practice. He was a member of the Virginia Senate from 1931-1951. Thank you for this outstanding tribute and life summary of my great Uncle Lloyd Robinette. His sister was Callie Robinette who married Abraham Jackson Livingston, my grandparents. Earl. L. Livingston was my father and one of Callie’s children. You do not have her listed in your account. Could there have been an oversight? I would greatly appreciate your response. All children of Samuel R and Narcissus Robinette are known to me. Most of this report seems accurate according to records that Uncle Lloyd (Great –altho I always called him Uncle Lloyd) left . Of course Charles Robinettes house was frame. The Narcissus/Samuel story was told to me much more in detail by my Grandfather. Fascinating story! Of course I was named after all the Samuels. Are you Patti Lynn’s daughter? Hi. My grandmother was Bower Ivy Robinette. Her father was Wesley Robinette.